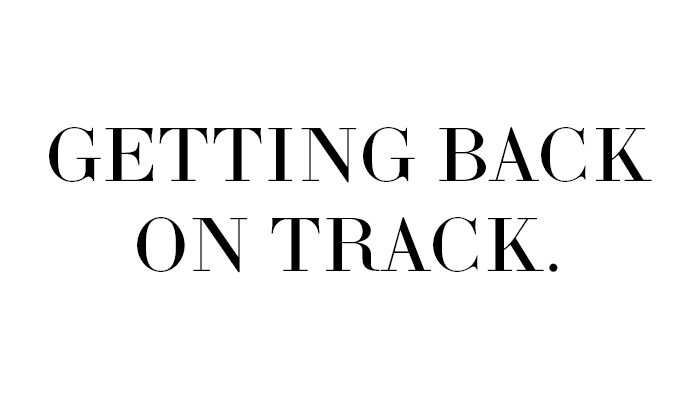 Getting Back On Track - 4 Easy Tips. God, sitting down and actually writing a blog post seems almost foreign to me right now. If you read my last post, you'll know that I've taken just over a month's break from blogging due to various factors in my life, and I now feel ready to return to it, and I can't wait. Even without a break from blogging, it can be so easy to lose control when it comes to blogging, after all it takes a lot of dedication and effort, and life really can get in the way. So, what better a way to reintroduce myself into writing than to give a few definitive tips on how I, myself, will be getting back on the blogging road. 1. Create A Schedule | My schedule before the break was to post on Sunday and Wednesday each week, at 8am. I'll be continuing on with this schedule, hopefully introducing a third uploading day in a few weeks, once I get more comfortable again. 2. Plan | It's all well and good having a schedule, but it really isn't so effective unless you have a set of blog posts ready to go up on each scheduled day; keep a diary, a calendar, a desk planner - whatever. Make sure you know what you're writing, and when. 3. Photograph In Bulk | There's honestly nothing worse for me than getting up early in preparation for taking blog photos, only to discover that the weather is absolutely shite. I love to take advantage of the brighter mornings and have a couple of days a week dedicated to photography. If you have your blog posts planned out, this really won't be a problem. And it means that if you do get caught out by a gloomy day, you'll always have a backup! 4. Write In Bulk | Pretty self explanatory to be honest, but this is what I struggle with the most. I definitely need to set a fair few hours aside to write enough blog posts for the upcoming weeks - I don't know how you daily bloggers do it! Do you do any of these, or do you find any of these things particularly challenging? Let me know!